Adventuring under the sea has a dangerous and classic appeal. 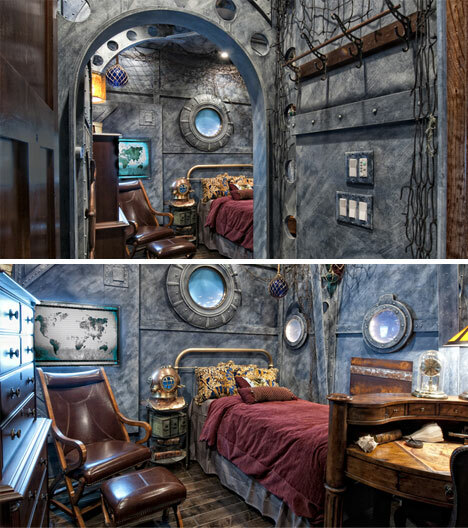 These images of incredible submarine-themed rooms and decor are the perfect inspiration for a crazy decorating adventure in one’s own home. The most intriguing designs with submarine inspirations tend to have a ton of steampunk elements, that add to the old-style naval design. This particular apartment has integrated LED controls that allow the apartment owner to manipulate nearly any aspect of the lighting. This is an example of an Extreme Makeover episode that hit right on the money. Inspired by 20,000 leagues under the sea, the portholes add a fantastic effect and make it seem like the room is entombed at the ocean floor. These exceptional models of antique diving suit designs look like they could also serve in space. The image on the left is of a wild suit found in the Paris Musée de la Marine that appears it could handle almost anything thrown at it. One wonders if it served as inspiration for the videogame Bioshock. 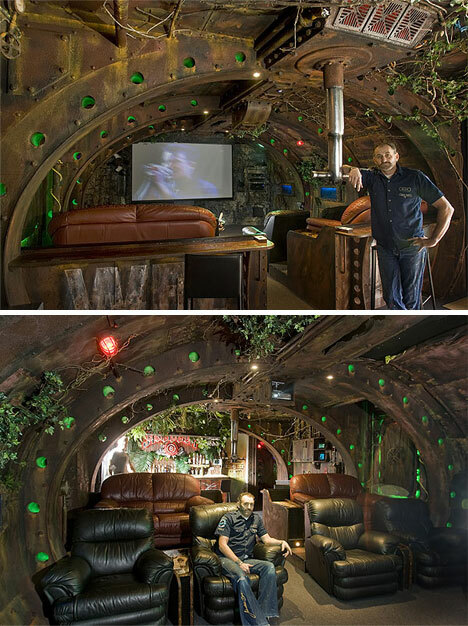 The idea of having a submarine / jungle theme for a movie room is an intriguing one. How did the submarine get there? The atmosphere of this room is definitely unique, and the comfortable furniture is a great contrast to the worn and rugged steel ribs of the submarine. 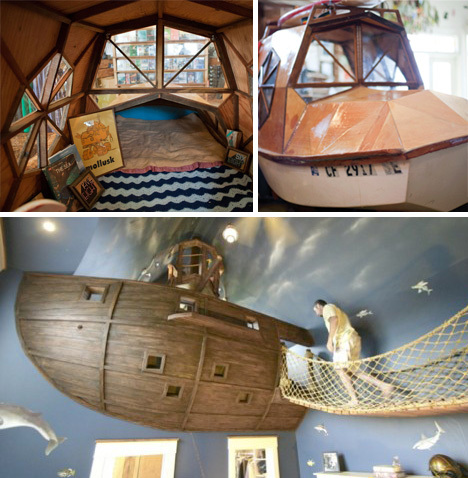 A child’s room should never be boring. Take these oceanic themed bedrooms as the perfect example of a room that can wow everyone who enters it. 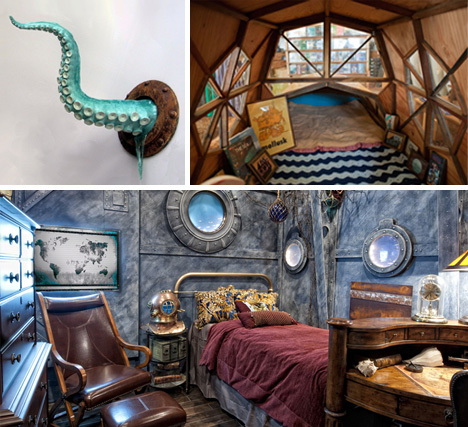 Artist Jay Nelson created the perfect nautically themed bed, totally encased in what looks to be the perfect exploration craft into the world of dreams. 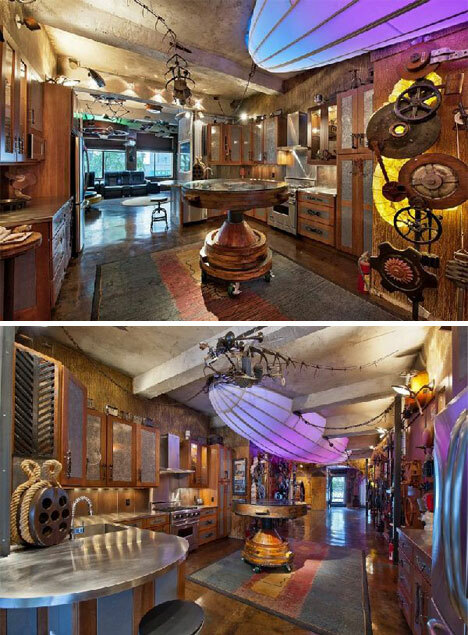 Kuhl design build created the much more involved bedroom featured in the bottom image, with an entire ship anchored to the wall. 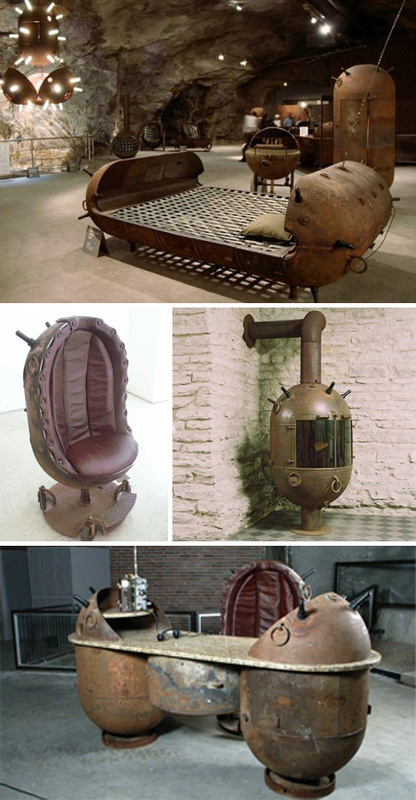 Estonian artist Mati Karmin has created a fantastic set of furniture built out of the decommissioned hulks of old naval mines. The bed, desk, and fireplace all seem comfortable enough, but it’s hard to imagine anyone actually being comfortable in that chair. 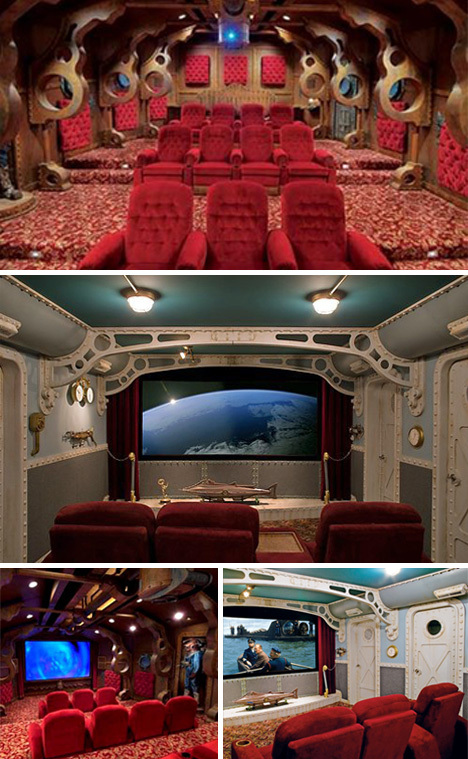 Anyone who has the funds to create a home movie theater also has enough money to embellish it a little. The fixtures in the red Nautilus themed room showcase a cozy and elegant design that matches well with the descriptions from the original science fiction tale. The room with the white submarine doors is much more authentic and rough, which is likely favored by true naval aficcionados. For a quick addition to any nautical theme, an exploratory tentacle can be just the right touch. 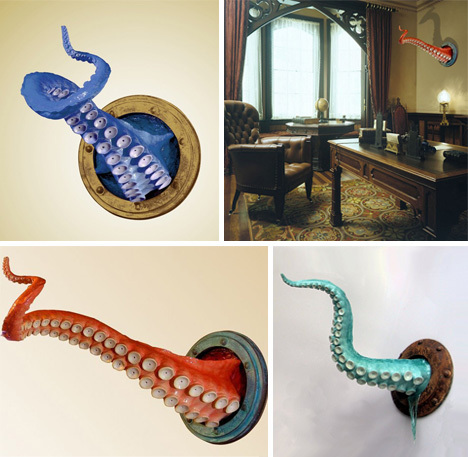 ArtAkimbo’s etsy shop has an incredible variety of tentacles to match any color scheme.